On March 26, 2012, NYLS celebrated the publication of Professor Ross Sandler’s latest book, Jumpstart Torts (Wolters Kluwer, 2012). The book is for incoming law students and explains what they need to know in order to begin the study of the substantive law of torts. Wolters Kluwer has adopted the book and is building an entire series of Jumpstart books based on Jumpstart Torts. 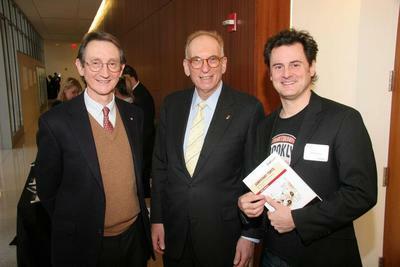 Pictured above are Richard Mixter, an editor from Wolters Kluwer; Prof. Ross Sandler; and Jeff Hopkins, illustrator of the book.